American Apparel just launched their first-ever men's jean that they've added to their popular women's denim collection. 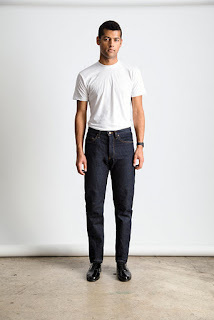 The jeans are called Regular Fit 100 and they were designed, cut sewed and washed in American Apparel's facility in Los Angeles. According to George Atlan, Director of Denim at American Apparel, the Regular Fit 100s are a "truly authentic pair of jeans" which "the market has lacked for a long time." Here are a few photos of AA's women's denim collection. I was flipping through channels this morning while my kids were brushing their teeth when I happened to stop on the Home shopping Network. The slick sales lady-you know the one who pretends to be your friend but then you realize that she can't be your friend because her sole job is to separate you from your money- mentioned that HSN had sold over 24,000 pairs of, get this, Pajama Jeans. Apparently women across the country are interested in looking good and being comfortable at the same time. The absolute nerve of them. In french the saying is "pour etre belle il faux souffrire"
Which translates to "To be beautiful one must suffer." I never liked or believed in that saying but I'm not sure that I'm ready to wear PJ jeans. Anyway here is a little info about them. *They come complete with brass rivets to give them the jean look. The model looks pretty good in them but I might be a little too denim obsessed to try these out. J Brand's new dark washes arrived just in time for Autumn. They are called Nightwish and Dynamite. I love the slim bootleg and the skinnys are always hot!